Palliative care has been declared an important topic for public health. In turn, concepts of public health such as health promotion are highly relevant for populations in need of palliative care. In recent decades, public health and epidemiological research methods have been applied to study the circumstances of dying, including palliative care provision, in large communities or populations. This chapter starts by outlining several characteristics that distinguish public health from clinical research in palliative care. It subsequently gives an illustrative, rather than exhaustive, overview of several different methodological approaches that have been used in public health research in palliative care, as well as their advantages and limitations. The focus is on quantitative, epidemiological methods, which reflects the current dominant approach in public health research. These include population-based survey research and specifically the mortality follow-back design, the use of death certificate data to study place of death, studies of routinely collected administrative data on the population-level, and the use of existing epidemiological monitoring tools. Finally, the chapter describes the importance and contributions of qualitative and mixed methods public health research in palliative care. It does so by describing examples of community-centered palliative care initiatives and research in less visible populations. 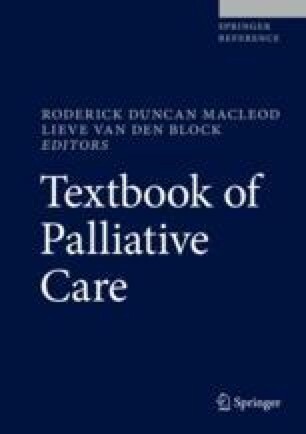 Acknowledging that no single of these methods can answer all relevant questions about a topic, this chapter argues that it is the combination of a diverse set of research methodologies that will lead to the best possible view on and understanding of the circumstances of dying and provision of palliative care in populations. Billings J. Using administrative data to monitor access, identify disparities, and assess performance of the safety net. Agency for Healthcare Research and Quality; U.S. Department of Health and Human Services. 2003. Available at: https://archive.ahrq.gov/data/safetynet/billings.htm. Accessed 7 Mar 2018. World Health Organization. Constitution of WHO: principles. 2018. Available at: http://www.who.int/about/mission/en/. Accessed 4th Apr 2018.